Will ich mal nen Thread zum nächsten Teil aufmachen. bekannt ist und bin da i-wie nen bissl zwiegespalten. dann nachgeliefert wird, leicht abgeändert, per Addon und uns als "NEU!!!" verkauft werden soll. Also schon mal sehr geil! werden als jetzt schon in Teil V.
Also was sind eure "Meinungen, Wünsche & Fakten ;)"??? wir wollen schon etwa gleich gut starten. überarbeitet wird das man nicht so viele Abhängigkeiten hat. nen anderes Wirtschaftssystem her. Nicht Einheiten kosten nach Runden erhöhen sondern wirklich nach Stärke. was ich bisjetzt so gelesen hab hört sich gut an, mir persönlich ist der grafikstil etwas zu cartoonhaft. vorbestellen werde ich nicht, ich will erst gucken ob das produkt zu release schon sehr gut ist oder man dafür 1-2 add-ons braucht. gespannt bin ich aber aufjedenfall! Dieses System, die Gebäude der Stadt auf den Hexfeldern im Einflussbereich zu bauen und auf der Karte sichtbar zu machen, hatte bereits Warlock, ein Fantasy-Civ V-Clone (sehr empfehlenswert! ); da fungierten diese Gebäude dann gleichzeitig als Straßen, was ja Sinn macht, da man sich innerhalb einer Großstadt schneller bewegen kann. mir persönlich ist der grafikstil etwas zu cartoonhaft. PS: Seit HEUTE muss sich wohl ohnehin JEDES Fantasy-Strategiespiel an Total Warhammer messen lassen, was die Graphik betrifft. Kann mich i-wie net mit der Grafik anfreunden... hätte mich über mehr Details gefreut. Ansonsten viele Skips und gerede. By Adam Smith on May 25th, 2016 at 3:00 pm. The barbarians are at the gates. They’re not here to kick the gates down and storm the city though; instead, they retreat, in the direction of the camp that spawned them. That’s new. It’s the tip of the iceberg as far as changes go, but it’s an illustrative example of what the early stages of this game are all about. Civilization VI [official site], at this stage of its development, is host to the most reactive AI that I can remember in the series’ long history. 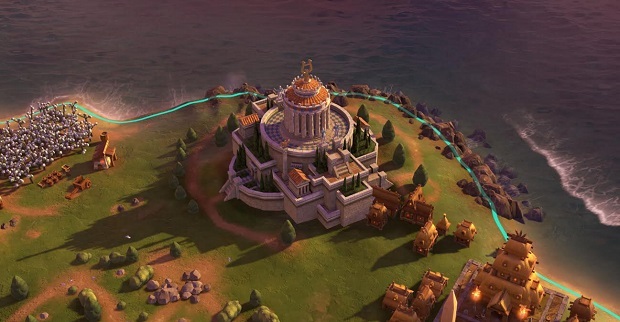 Lead designer Ed Beach and his team are building a Civ game that they hope will pry long-time players out of their established comfort zones, and a too-brief 60 turns with the game last week showed plenty of evidence that they’ll achieve that goal. It’s a busy game, even in those early turns. Traditionally, the early eras see me scouting for prime settlement spots and working my way through city improvements, research and windows in a very specific pattern. Usually, I’m aiming to pile up as much Culture as possible, neglecting my military as soon as the first few surrounding barbarian encampments have been plundered and razed. In this game, which took place on a small pre-tested map with three AI opponents, I found myself blown off course almost immediately. The first centuries of Civilization are no longer very civilized. A City State to the northeast of my capital (Beijing) marked my first contact and there were no problems there, but as soon as I met my American neighbours, rumblings of discontent were heard. 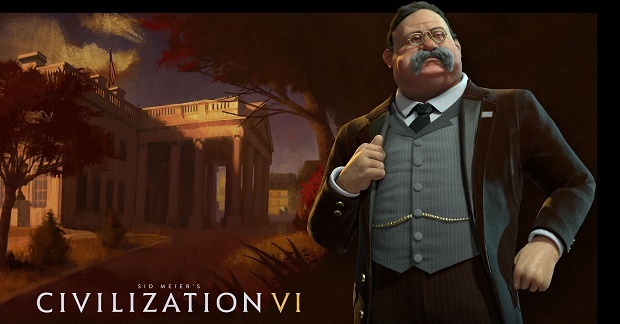 Teddy Roosevelt, as depicted in Civ VI’s full-body animated diplomatic encounters, is a smiling bear of a man. He makes reference to the toys that go by his name in one line of dialogue, which is one of those weird reminders (as if the immortal presence of a single leader weren’t enough) that Civilization’s awareness of any particular historical moment is flexible in the extreme. The leaders, as ever, represent the entire span of their civilization’s existence, lending one aspect of their personality or historical rule as a fixed agenda – a second agenda is selected randomly from a pool of possibilities at the beginning of each new game. What that means, in practice, is that you’ll learn to expect certain kinds of behaviour from each leader, but that base personality type will be modified by the second, hidden agenda. In Roosevelt’s case, his fixed agenda causes him to behave aggressively toward any civ involved in a war on his own continent – that’s to say, he’ll look unkindly on violence close to home, while tending to turn a blind eye to military action overseas. I believe, though can’t be sure, that he is much more inclined to take issue with the aggressor in a home-continent war, and that was certainly the case in my playthrough, when Cleopatra entered the fray. The Egyptians, under the queen of the Nile, have a simple base agenda: they respect civs with a large military and see those without as potential victims. On our first meeting, Cleopatra seemed impressed and willing to play nice. In hindsight, that was probably down to the fact that I’d built a few extra military units to clear our the barbarians near my home city and chosen site for expansion (a lovely coastal area with access to the Great Barrier Reef). Considering we hadn’t figured out how to harness horses yet and couldn’t compete with the Egyptian chariots that were already roaming the plains, the Chinese military was fearsome enough to command respect. And then I fucked up. Or, rather, I made a choice that had immediate consequences. In an effort to improve cashflow so that I could buy a couple of improvements in Beijing, I disbanded the majority of my armies as soon as the barbarians had been eliminated. Cleopatra considered the situation for a couple of turns and then sent an insult, identifying precisely the kind of weakness that irritates her. Within a few decades, we were at war. It only took a few more turns for Teddy to lock and load, declaring way on Egypt, presumably annoyed by Cleopatra’s disregard for the continental truce that the Americans had hoped would hold forever (or at least until they decided to break it themselves). We hit the sixty turn limit for the preview build soon afterwards, with Cleopatra amassing an enormous army while I concentrated on development of a theatre district in Beijing. While Beijing went all artsy, my second city, Shanghai, harnessed the natural wonder of the Reef to instill a sense of spiritual superiority in my people. What was most striking – and most exciting – about the session lay in the actions of the AI: here was a game of Civ in which two AI entities had involved themselves in wars for specific reasons that I could identify. That also meant I could have, given more time, defuse the situation without resorting to the centuries-long process of attrition and churn that so often typifies conflict in the series. All of that goes back to the reactive nature of the AI. Even the city state had involve itself, choosing to side with the Americans and producing armies of its own. If I’d shifted my production efforts toward the creation of a powerful military, it seems likely that Cleopatra would have sued for peace, seeing a competitor rather than a victim, and the choice as to whether the war should continue would then have been mine. Then again, without knowing her secondary agenda, I have no idea if my newfound religious focus or habit of hastily constructing wonders might have been cause for further antagonism. 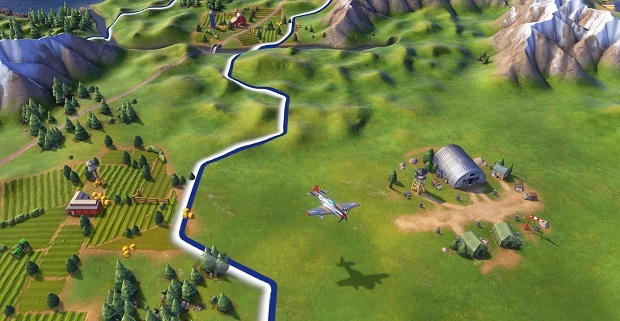 As well as being a busy Civ – with trade, religion, and all of the geographical boosts and exploitation detailed in our earlier preview – this is a volatile Civ. The AI acts with intent and the somewhat predictable nature of its behaviour, thanks to those agendas, appears to make its actions more believable, lending a rationale and credence to what might otherwise seem like rash decisions. Given my limited time with the game, it’s impossible to say how diplomacy and AI behaviour will change through the eras, but it’s an area of the game in which Firaxis have made some major changes. Some of that is already evident, with the gathering of rumours. You may learn, for example, that the Americans are planning to declare war on the Egyptians, but only if you have the correct infrastructure in place. Envoys might learn a thing or two, but trade routes are the most direct form of early ‘espionage’. In a fine example of the kind of interesting choices that Beach and his team want to ensure during every turn, establishing trade routes is now a case of studying the geography (particularly distance), the direct supply benefits and the potential for a spot of reconnaissance. In later eras, espionage will become a more formal affair, as will diplomatic relations. While the reasons behind aggression can be understood in the classical and pre-classical years, there is no need to justify war to friends and neighbours. While I don’t expect casus belli on the level of a grand strategy game, as governments and diplomatic organisations become more complex, it will become more difficult to declare an ‘unjust’ war without suffering damage to your reputation. You’ll need a good reason to commit your troops. That’s in stark contrast to Roosevelt’s opportunistic kidnapping of any settlers who stray too close to his armies in those first sixty turns. Given the focus on the ‘unstacked cities’ in the reveal of the game, I expected to be writing a lot more about construction and management than about the AI. Given that the details of those systems were already known, and detailed in our earlier preview, I’ve concentrated on the experience of playing the game, and the assertive and reactive nature of the AI was the most outstanding feature. The cities are promising, however, particularly in that the new ‘district’ improvements appear to offer new choices for construction rather than simply replacing old ideas. They’re a relatively costly upgrade, placed on a tile around the city rather than in the centre, and as well as taking advantage of features of the terrain, they can enjoy adjacency bonuses. Once finished, they offer new possibilities for improvements, allowing you to design cities that are truly specialised. ‘Design’ is the key word. I haven’t played anywhere near enough to know how well the cities will work out over an entire playthrough (or a hundred), but there’s a definite sense of creating something distinct rather than simply filling an empty vessel. Each city is an element necessary for your particular civ at this particular point in this particular situation. Whether you’ll be able to satisfactorily or successfully respec them as the times require isn’t yet clear, but it’s an enticing possibility. And as it is with the cities, so it is with the civilization that contains them. Social policies are selected from a deck that grows as you discover new civic ideas (research now divides broadly into civics and ‘physical’ tech), and the number and type that can be in play at any one time is based on your government type. With research boosts now tied to in-game achievements and geographical discoveries, there’s more incentive to tailor your civ to its surroundings and situation, but the ability to tinker and specialise through policies and faith-based bonuses adds flexibility. All of those possibilities combine to make Civ VI a more involved game than I expected. It must be stressed that I’ve had very limited experience with the game so far, but if all of the systems in play unfold across the eras in a satisfying fashion, the game will be far more than Civ 5.5. 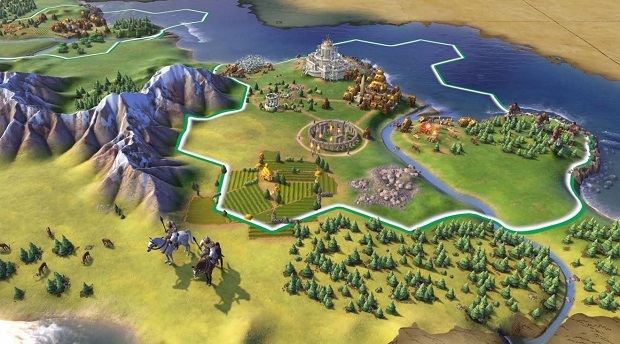 Despite an obvious heritage – it shares features and a lead designer with its predecessor’s expansions – Civ VI already has its own character. It’s in the AI, in the cities and in the application of policies to boost or tweak certain elements of your nation. It’s attractive too, in motion, particularly the way in which unobserved but revealed areas of the map are displayed as an actual ink and paper approximation of the terrain. Truth be told, I was sold on those first screenshots but can understand concerns about the oversized cartoonish look. It’s designed to be legible though and that’s because there’s so much more information than you might expect rather than because the game has been streamlined in any way. I used the word ‘busy’ earlier – twice, in fact – and it keeps bouncing back to my fingertips as I’m typing. Civ VI has a liveliness that I don’t associate with the series, a sense that cogs are turning and that machines are under construction. There are possible pitfalls in that energetic form, and ensuring the interface is equal to the task of disseminating information without either obscuring or holding hands too tightly will take a formidable effort, but it’s good to see so many ideas working in tandem. It’s also important to remember that there’s plenty of development time left for the finer details to change, and that the immediate conflicts may have been due to the small map size as well as the AI itself. 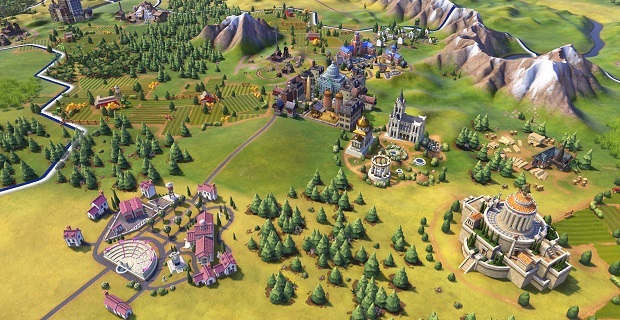 Civilization has become a foundation on which designers and artists create unique experiences, whether that involve the added complexities of Civ IV or the combat overhaul of Civ V (retained and improved here). Civ VI certainly has enough about it that feels fresh and by playing upon the unique personality, strengths and weaknesses of each civilization in the game, and how those things change over time and from one playthrough to the next, it doesn’t feel quite like anything the series has done before. Sixty turns isn’t enough to judge the game, of course, and it’s certainly not enough to scratch the itch. It’s almost always a good sign when I walk away from a preview event wishing I had a copy of the game in question, not just to play but to explore. Civ VI already has me hooked. It’s looking to be the rare sequel that introduces new mechanics without stripping away the accumulated features of its predecessors. Sid Meier’s Civilization VI is out October 21st. For more details, take a look at our first in-depth preview. Geht mir auch so, werde es nachher mal lesen. Erstmal zur Forschung, ihr werdet trotzdem noch in der Lage sein alles zu erforschen. Das neue System gibt euch lediglich einen Boost, wenn ihr für die entsprechende Forschung die Zusatzbedinungen erfüllt, wie z.B. Stadt am Meer für Segeln. Finde ich persönlich sehr cool. Ich wünsche mir eher noch mehr Verzweigungen bzw die Möglichkeit mich wirklich bei der Forschung zu spezialisieren. Momentan muss man ja früher oder später alles erforschen was geht. Wenn ich aber nunmal keine Lust haben sollte eine Religion zu gründen, wünsche ich mir die Möglichkeit diesen Zweig vernachlässigen zu können. Oder eben wenn ich eh im Inland bin will ich nicht auch alle Seefahrtstechnologien erforschen müssen. Beim Grafikstil hab ich erstmal auch kotzen müssen. Die neuen Videos sehen schon etwas besser aus und könnten in Kombination mit einer Farbanpassung wie folgender durch Mods ein für mich erträgliches Gesamtbild abgeben. Das sieht doch schon viel besser aus. Ich kann diesen Farben Overflow nicht leiden. Ich versteh ja, dass das eine Anpassung an die gammeligen Prozessoren in Smart-phones und Tablets ist, aber Civ ist jetzt nicht wirklich ein Spiel, dass man "Mal eben" in der Bahn spielt, also was soll der Quatsch? Naja, vllt seh ich dass dann nächstes Jahr für 15 € irgendwo im Angebot und denk mir etwas wie "Kann nicht schlimmer als ne Ladung Fastfood sein..."
ALLES WAS ICH ANSABBER' GEHÖRT MIR! Ich denke damit will man die junge "clashofclans, empire4kingdoms, forgeofempires, pro7 games usw." Spielergeneration ansprechen. Die alten Fans kaufen es eh(Auch wenn im Interview nichts davon gesagt wurde). Die sind an diesen cellshading look gewohnt. An sich ist gegen den Stil nichts einzuwenden. Gerade auf schwachen Systemen ist mir gut gemachte, satte Comicgrafik lieber als miese pseudorealistische Texturen. Gerade auf kleinen Handybildschirmen ist Übersichtlichkeit nochmal deutlich wichtiger. Für eine renommierte Spieleserie, die in erster Linie auf Desktop-PC's und auf großen Monitoren gespielt wird aber eher unpassend. das kann natürlich sein, die entwickler selbst meinten dass mit dem grafikstil es einfacher ist alle gebäude/einheiten sofort zu erkennen, obwohl man maximal rausgezoomt ist. und das die meisten spielen eben maximal rauszoomen. gegen quitschbunte grafik habe ich eigentlich nichts dagegen wenn sie passt (in fantasy strategie wie z.b. homm5 oder wc3).